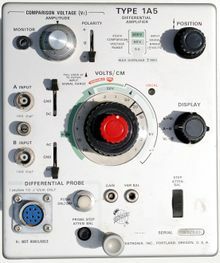 The Tektronix Type 1A5 is a differential amplifier plug-in for 500-series scopes. It has an Amphenol 165 series connector on the front panel for direct connection of the Type P6046 Active Differential Probe. Type 1A5 was introduced in 1967, replacing Types W and Z, and lasted until the end of the 500-series scope line. Like most Tektronix differential plug-ins, the 1A5 has three modes: VA−VC, VA−VB, and VC−VB. VC is controlled by a ten-turn potentiometer and can vary from −5 V to +5 V (0.5 V on the 5 V/div to 20 V/div ranges). This page was last edited on 20 March 2019, at 14:41.